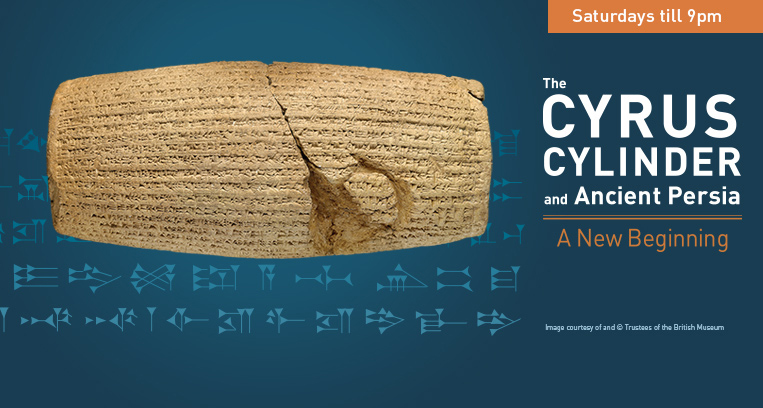 The Iran Heritage Foundation is pleased to announce that the Cyrus Cylinder and its accompanying exhibition, The Cyrus Cylinder and Ancient Persia: A New Beginning, is on display at the J. Paul Getty Museum at the Getty Villa, Los Angeles, from October 2nd through December 2nd 2013. The exhibition is organized by the British Museum in partnership with the Iran Heritage Foundation (IHF America) and the Arthur M. Sackler Gallery, Smithsonian Institution. Since its discovery in 1879, the Cyrus Cylinder has prompted wide-ranging discussion about the benevolent nature of Cyrus’s rule. At this one-day symposium, experts address a range of perspectives from which the Cylinder—and the Achaemenid Empire generally—have been understood. Speakers will consider Babylonian precursors, the Persian and Jewish traditions, the ancient Greek view, and the representation of Cyrus in modern Iran. Symposium fee $15. Generous support for this program was provided by the J. Paul Getty Museums Villa Council. John Curtis, Keeper of Special Middle Eastern Projects at the British Museum, speaks about the Cyrus Cylinder, an ancient clay cylinder inscribed by the Persian king Cyrus the Great after he conquered Babylon (present-day Iraq) in 539 B.C. Curtis explores the reasons for the cylinder’s historical significance and the importance it has acquired since its discovery in 1879. Free; a ticket is required. The Achaemenid Persian Empire (about 550–330 B.C.) was enormous and incorporated many different cultures. Before rapid transit or instant communication, how were affairs of governance conducted in a sociopolitical entity of this size? Archaeologist Elspeth Dusinberre examines government archives, food, alcohol, gender relations, and even the original Pony Express to illuminate how the empire founded by Cyrus the Great functioned. Co-presented with the Archaeological Institute of America. Free; a ticket is required. Tickets available beginning Thursday, October 10, 2013. The Greeks feared, admired, and maligned the Persians from before Cyrus until after Alexander the Great. Explore the Greek view through tales and art with educator Shelby Brown, then compare the Persian perspective and try your hand at cuneiform. The course ends with a tour of the exhibition The Cyrus Cylinder and Ancient Persia: A New Beginning. Course fee $35 (includes refreshments). Complimentary parking. Join artist Anna Mayer for a ceramic workshop pairing language and clay. Begin with an exploration of the exhibition The Cyrus Cylinder and Ancient Persia: A New Beginning. In the studio, learn hand-building techniques to create ceramic cylinders and vessels inscribed with your own text dedications. Ceramics will be fired following the course for later pick-up. Course fee $150 (includes materials and lunch). Complimentary parking. Discover the flavors of the ancient Near East with chef and educator Maite Gomez-Rejón. Tour the exhibition The Cyrus Cylinder and Ancient Persia: A New Beginning and pick herbs in the garden to prepare and enjoy a meal showcasing the multiethnic cuisine of the Persian Empire. Course fee $85. Complimentary parking. Tickets available beginning Tuesday, October 2, 2013. The music of Mahsa and Marjan Vahdat reflects the evolution of Persian song. Part of a new generation of musicians who are university educated and devoted to their artistic cause, the Vahdats uphold a waning tradition in today’s Iran. Tickets $25. Generous support for this program was provided by the J. Paul Getty Museums Villa Council. Drop by with your family to learn how scribes in ancient Persia created documents such as the Cyrus Cylinder. Try your hand at writing your own cuneiform (a type of old script) message! This is a free, drop-in program. Hours and Admission – Please notice that while admission is free, advance reservation is required. Specifically because of the Cyrus Cylinder exhibition, the museum will be open until 9:00PM on Saturdays. Maps, Parking, Directions – Getty Villa is located in Pacific Palisades on Hwy 1 (Pacific Coast Hwy). Through a partnership between IHF America, the British Museum, and the Smithsonian's Sackler Gallery, the Cyrus Cylinder is now touring the United States for the first time: Washington DC to Houston, NYC, San Francisco, and Los Angeles. See dates and venues. The Completion of the Cyrus Cylinder Tour of the U.S. The Cyrus Cylinder touring exhibition (2013, United States) is organized by the British Museum in partnership with IHF America and the Arthur M. Sackler Gallery, Smithsonian Institution. The exhibition is supported by an indemnity from the Federal Council on the Arts and the Humanities. IHF America is a US-based 501(c)(3) non-profit organization with a mission to promote and preserve the Persian culture, history, languages, and art. IHF America is the principal sponsor and underwriter of the tour. The tour will be hosted by five major museums across the country, and will take place during March-December of 2013. Find out more about the tour. Cyrus Cylinder images, images of the objects from the British Museum, and the British Museum press release are © Trustees of the British Museum, and are used with permission. All other content is © IHF America, and can be used with permission and attribution. IHF America is a 501(C)(3) US registered public charity.